Storm Brewing Newfoundland, as I discuss in my overview, was one of Newfoundland’s first microbreweries. In this post, I’d like to speculate a little on the current situation of Storm Brewing and to post a few pictures of the wonderful beers they have made over the years. 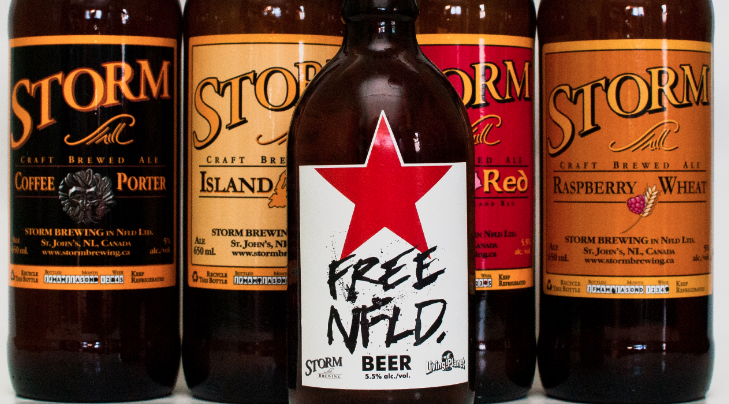 My understanding of Storm’s current production situation is that it is basically a part-time job for the owners. As far as I can tell, they run at capacity right now and, because of high demand, their beer sells out of the few NLC and corner stores where they retail in short order. I get no inclination that an expansion or new product is on the way, so I’m guessing that right now it is a pretty happy self-sustaining cottage industry. Their demand excedes their supply, so they seem to be pretty economically stable. Storm Free Newfoundland Stubby, c. mid-2000s, my collection. Now, they switched out of stubbys a couple of years back (2008, if memory serves – but check that date) and they use “mainland long-necks” (i.e. not the semi-necks Newfoundland is famous for). 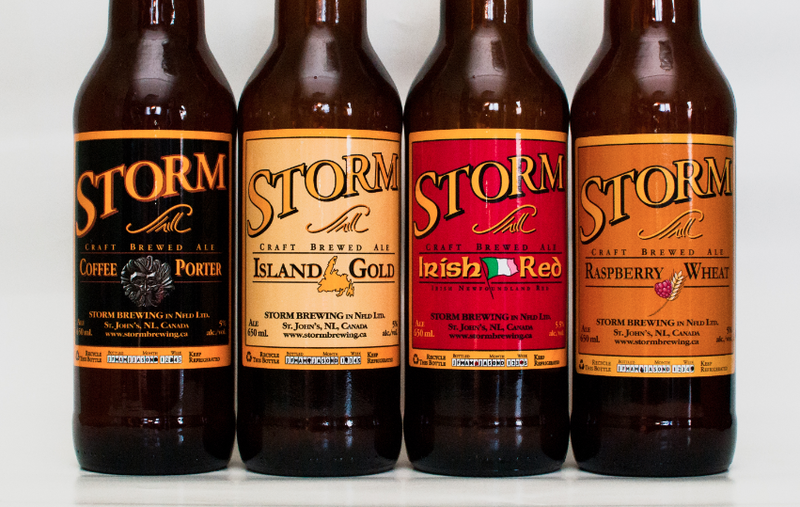 Storm was also the first brewery that introduced me to the “bomber” bottle. Used pretty much religiously throughout the United States craft beer scene, a bomber was unheard of in Newfoundland before Storm. All of their current four beers are available in the very industry standard bomber. Storm Bombers, c. 2011-2012, my collection. In the above photo we can see their winter seasonal Coffee Porter, their all year-round Island Gold and Irish Red, and their summer seasonal Raspberry Wheat. What’s also great about Storm is their dating system. What’s great about it? Well, (a) they have one – something which beer geeks in the United States lament not having even on some top-shelf beers, and (b) it’s clear and uncomplicated. In the dating system, Storm is, well, best kind. Storm used to be a little more adventurous too. Take, for example, this beer. 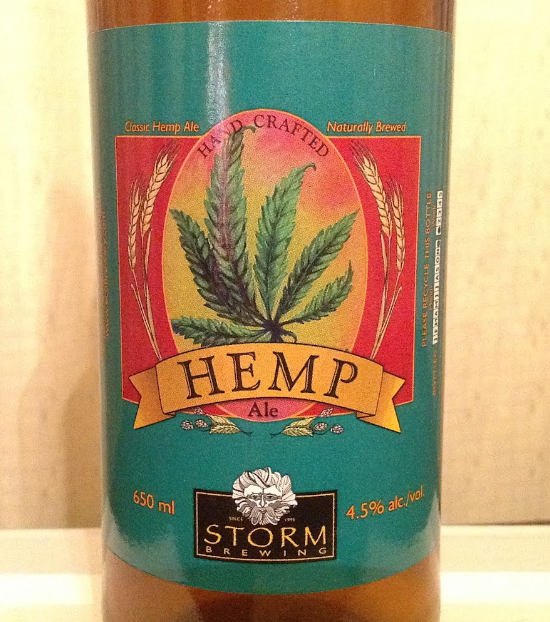 Storm Hemp Ale, c. mid-2000s, photo credit Colin Power. Aside from their lovely old logo (that lives on in their coffee porter symbol), it was a hemp ale! In Newfoundland! 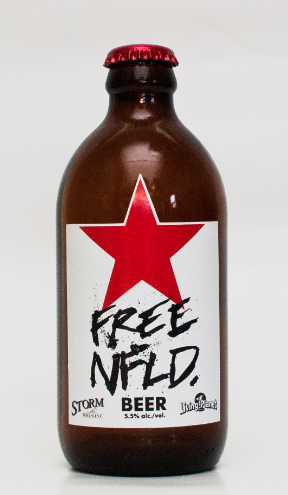 I remember really liking this beer and being quite sad when it was discontinued. Hemp ales are pretty rare, even on the mainland, so it was nice to have something pretty unique front-and-center in Newfoundland. Will Newfoundland ever start to catch up to Canada, or even to the maritime provinces, in craft beer and modern beer styles? I’m not really sure. But one thing is for sure, in Newfoundland’s Beer History Storm wrote the chapter on making a modern North American style craft brewery, with recognizable craft beer styles, work in Newfoundland. Nice article, thanks for that.